Jesu Ashram was founded in 1971 by Brother Robert (Bob) Mittleholtz belonging to a Christian (Roman Catholic) religious order called the Society of Jesus (Jesuits). He distributed medicines to the sick at railway stations and in the streets of Siliguri. One year later Sister Ivana, a nun from the Daughters of the Cross Congregation came to support Br. Bob in his work. Inspired by their good work some dedicated young people joined them as volunteers. They carried the sick, the old, the leprosy patients, and physically and mentally handicapped people to a small rented house. Many volunteers from India and abroad began offering their free service when they were moved with compassion. As the number of the patients increased there was no room in the rented building. A new Ashram was build in 1971 in Gurung Basti, Siliguri and was named “Jesu Ashram”. Later on it was decided to shift Jesu Ashramfrom Siliguri to Matigara in 1972 mainly for two reasons; more rooms and open place was needed for the Ashram and also many neighbors at Gurung Basti were against keeping Leprosy patients in the Ashram. This is the story of humble beginning of Jesu Ashram. Brother Bob who came from Canada was born on 3rd December 1928, died on 20th December 2003. His body is laid to rest in Jesu Ashram itself. Many friends of Brother Bob rich and poor alike come to Jesu Ashram to pay him homage. Sister Ivana who came from Croatia was born on 23rdAugust 1911 died on 10th April 2002. She is buried at Kurseong where she had spent many years forming young minds at St. Helen’s School. Though the bodily presence of Br. 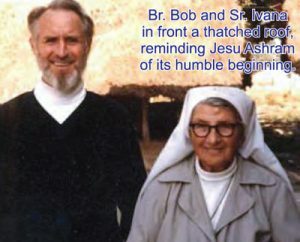 Bob and Sr. Ivana is not there, they are still very much alive in the minds and hearts of thousands of people who came in touch with them. Today many generous people from all strata of society continue to support Jesu Ashram to make the dream of its founders come true. Inspired by the person and teaching of jesus christ and by his healing ministry in particular, the darjeeling jesuits along with other collaborators, well-wishers and volunteers aim in jeshu ashram to provide quality health care service to the destitue and the poor, so that throught our dedicated service god’s compassion and love is manifested. Jesu ashram is commited to provide and run quality health care service which is free of cost. this care is rendered in loving compassion and with deep respect and dignity for the poor.